The Impossible Burger is known by vegans for, well, being vegan — and it’s known among non-vegans for being the closest thing to a “real” burger; it has all the flavor, all the texture, and none of the cholesterol, fat, hormones, toxins, and animal cruelty involved in producing meat. Best of all: It’s truly delicious. 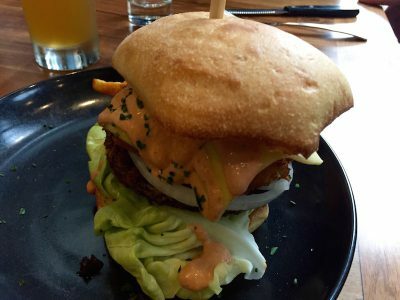 We’ve had the Impossible Burger before, and it was terrific — but the way Alchemy serves up this plant-based burger is truly delectable. 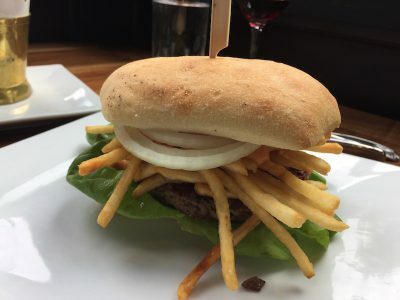 It comes with the pommes frites piled onto the burger itself, and the whole thing is smothered with vegan cheese and sauce that is creamy and spicy and delicious. It’s thrilling to see this amazing dish at one of Ashland’s most popular restaurants, as it shows a commitment to the vegans who are both local and visiting, and it will also help show the omnivores out there just how good plant-based food really is. In fact, we returned within a week just to enjoy this meal again, and it was served up slightly differently (but was every bit as delicious). Unfortunately, foie gras is still on Alchemy’s main dinner menu, which is a shame, as this is likely to keep a number of vegans from even walking through the door. 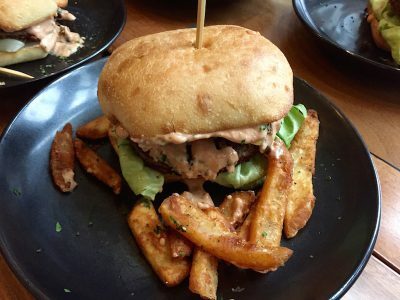 We do hope, though, that those who visit Alchemy try this vegan burger and make it even more popular, so that perhaps one day Alchemy will see the interest in delicious food that is cruelty free — which is better for their customers, for the animals, and for the planet.